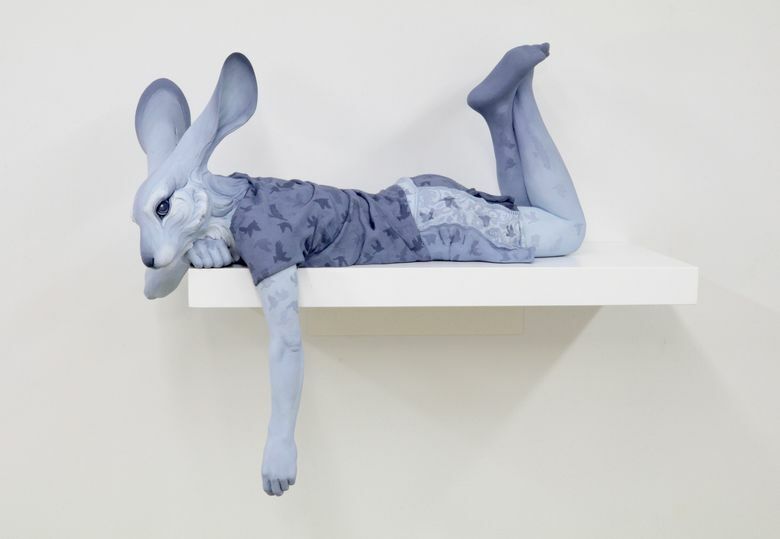 This summer, galleries are full of mesmerizing creatures, including a dreamy, blue human-bunny hybrid; rust-based humans; and Gary Hill’s homage to French actress Isabelle Huppert. This annual show at Abmeyer + Wood Fine Art, now in its third year, has become a highlight on my gallery-hopping calendar. Gallerist Jonathan Wood has a sharp eye for artists who combine extraordinary technical chops with unfettered imagination. This year, all eight artists are ceramic sculptors. “Lost in Thought,” by Beth Cavener and Alessandro Gallo, greets you at the door and immediately takes you into a dream world. Its bunny-human hybrid — sprawled on a ledge in swimming trunks and a sports shirt — dangles one paw down, as if to trail it in an invisible stream. Exquisitely realistic in its patent unreality, it suggests Lewis Carroll’s White Rabbit lazily turning the tables on Alice during her sojourn in Wonderland. Italian artist Gallo’s wild wit turns up in three solo pieces, including “Follow,” which skewers Twitter narcissism with its depiction of a trendy, duck-headed woman snapping a picture of herself in a mirror. Two pieces by Korean-American sculptor Kyungmin Park range from ridiculous to sublime. Her gorgeous “Guardian” depicts a sleeping girl resting against a watchful stag. “You’re Not My Prince Charming,” on the other hand, hilariously portrays a protesting youngster who wants nothing to do with the frog cozying up to her. Kelsey Duncan takes a grittier approach to the medium, especially in “IF-Town,” a bust of a baseball-capped fellow who has clearly seen hard times. His battered complexion, wrinkled plaid and sagging, tattoo-revealing T-shirt show such loving attention to realistic detail that it’s easy to forget the medium Duncan works in. This isn’t a sculpture dressed in cloth apparel — it’s all clay. Two early, high-spirited works by the great Seattle sculptor Patti Warashina and pieces by Jason Walker, Christopher David White and Cristina Córdova round out this excellent show. 11 a.m.-6 p.m. Mondays-Saturdays through Sept. 2, Abmeyer + Wood Fine Art, 1210 Second Ave., Seattle (206-628-9501 or abmeyerwood.com). One block away at Patricia Rovzar Gallery, other “strange critters” lie in wait. Vashon artist Morgan Brig’s wall-mounted sculptures are piecemeal creatures with a defiantly jaunty sense of themselves. Made from a grab bag of materials — copper, ceramics, fabric, antique glass eyes — they have a rough, startling charm. “I Shine a Little More Lately” is a prancing quadruped with a carnivalesque halo crowning its head. “Outer Space” is a more elaborate figure whose hat is a glass Tesla gizmo and whose tiny dangling legs have only the most tenuous relation with its hips. Brig’s paintings and collages have the same quirky spirit. “Opposites Attract,” which incorporates vintage photographs, is especially zany and amusing. Swiss-American painter Marianne Kolb taps into an eerier vein in her “Explorations with Rust” paintings. Kolb uses chance procedures, applying rust solutions to paper and spraying Sumi ink onto them to create purely abstract images. Then, with colored gesso, she covers up the outer portions of her rust-ink expanses until what’s left is a humanoid figure. The results can be spooky or serene. Either way, they’re novel and memorable. 11 a.m.-5 p.m. daily through July 30. Patricia Rovzar Gallery, 1111 First Ave., Seattle (206-223-0273 or rovzargallery.com). 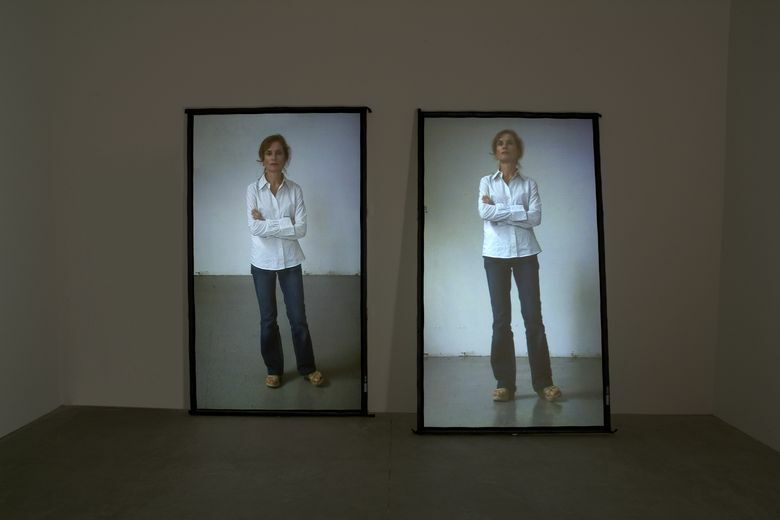 In legendary Seattle video artist Gary Hill’s 2005 installation at James Harris Gallery, the first three words of his title make punning reference to his subject, French actress Isabelle Huppert — not a “strange critter,” exactly, but definitely a mesmerizing creature. Huppert, in a full-body shot, appears on two vertical screens. In one, she seems to make eye contact with Hill’s camera. In the other, her attention seems directed at something overhead. Both video feeds document the same recording session. The fascination of the piece, which has been exhibited in New York and Moscow, stems from how divergent Huppert’s expressions can appear when viewed from slightly different angles. Hill’s piece has good company in “Body Language,” a group show featuring candidly informal or self-consciously staged photographs by Robert Capa, Diane Arbus, Bill Brandt and other camera legends. Also at Harris: work by Andrew Witkin, including unsettling dyed-cotton-tapestry images of crowds drawn from photographic sources and created using a computer-controlled loom. 11 a.m.-5 p.m. Wednesdays-Saturdays through Aug. 18. James Harris Gallery, 312 Second Ave. S., Seattle (206-903-6220 or jamesharrisgallery.com).